This is a great case. A young dog came to the hospital with a history of vomiting. The dog could not hold anything down. Initial X-Rays showed something in the stomach, but we could not determine what it was. The owner told us that she had seen the dog chewing on a piece of corn! We decided to do a Gastroscopy procedure, where we put a long thin scope with a color camera down into the stomach. 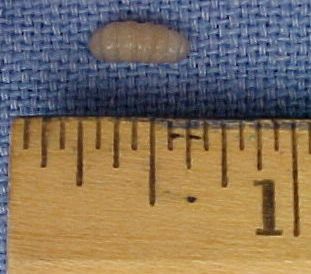 Once the scope was in the stomach, this corn cob pieces were spotted. We then passed a very thin "grabber" down the scope and one at a time, we removed all the pieces. This dog was able to avoid surgery since we had this special instrumentation. Press "Play" on the screen below. (Turn on sound). 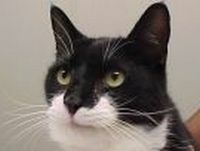 Case 2 - "Alien Invasion"
The cat pictured below came into the hospital with a "wound" on the neck. 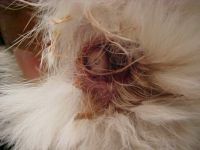 Once the area was clipped and cleaned, it became obvious to us that there was a little critter living inside this cat! 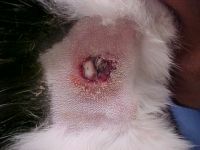 After giving the cat a little shot of local anesthetic, we enlarged the small hole and invited the critter to come out! Case 3 - "Battle of the Bulge"
The next case is an older dog that was presented to us for a routine physical examination. When I felt her belly, I noticed a lump about 5 inches in diameter, probably on her spleen. We scheduled the dog for surgery and it is a good thing that we did, because the mass was on the spleen and it had already ruptured. Below are photos of what we removed and the nifty device that we used to do the surgery. This is the entire spleen with the mass attached. This is a close up of the mass with the crack where it was actively bleeding. The instrument that we used to remove the spleen is a Harmonic Scalpel. There are no sutures, no clips, and no bleeding!